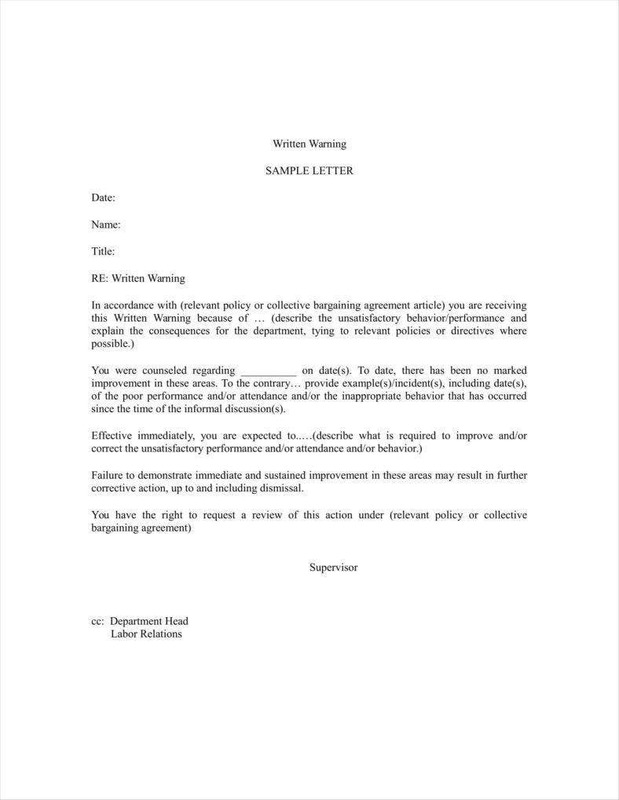 When it comes to giving fair warning to your employees, staff warning letters would be an invaluable tool for bringing any infractions to their attention. Of course, there are some ways to make sure that the message sinks in, such as by using verbal warning letters. After all, this allows you to make sure that any verbal warnings were understood, which makes the task of amending any behavior much easier. 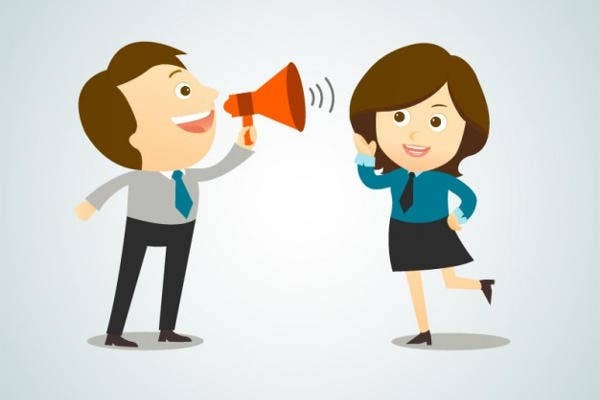 This method allows your warning notice templates to be doubly effective now that you can provide more reminders for employees to improve their behavior. Keeping this in mind can serve to make using your official warning letter templates all the more effective. If you really are set on making the most of your employees, then anything that might make them more likely to improve themselves should sound like an especially enticing tool. Part of knowing how to properly use the tools you have is understanding what they can do for you. In this case, being aware of the functions of a written warning letter should make you all the more adept at using them yourself. Of course, you should be aware of what functions verbal warning letters do have in order to find out exactly how you can apply that to any situation you are likely to encounter. 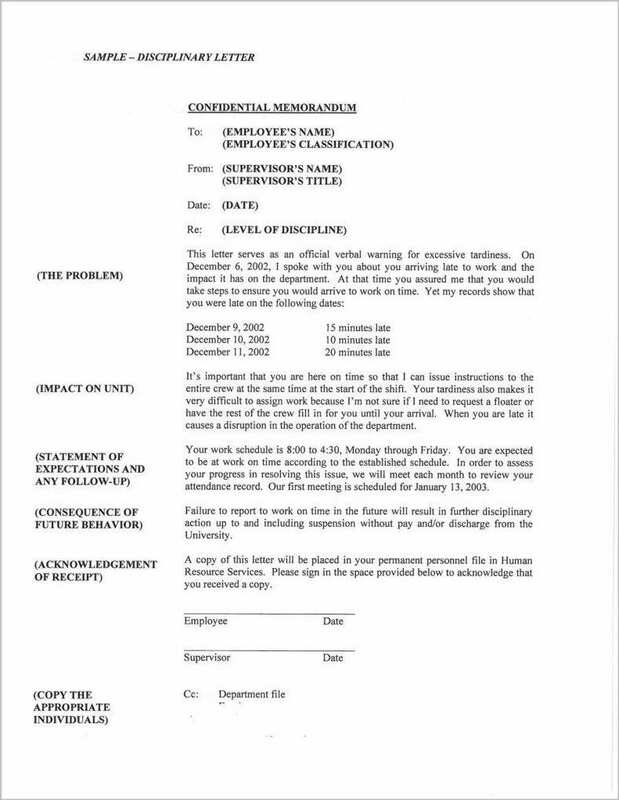 Most warning letters have the function of reminding their recipients of any relevant disciplinary actions or actions employees have to take to improve their behavior. This is an especially relevant function in the case of verbal warning letters as these letters in particular are meant to follow up verbal warnings sent earlier. So you should keep in mind that while warning letters are able to serve as reminders in general, it is more of a requirement for verbal warning letters. In this case, verbal warning letters have to adhere more to the idea that they are meant to remind recipients of whatever information was discussed prior to sending the letter. 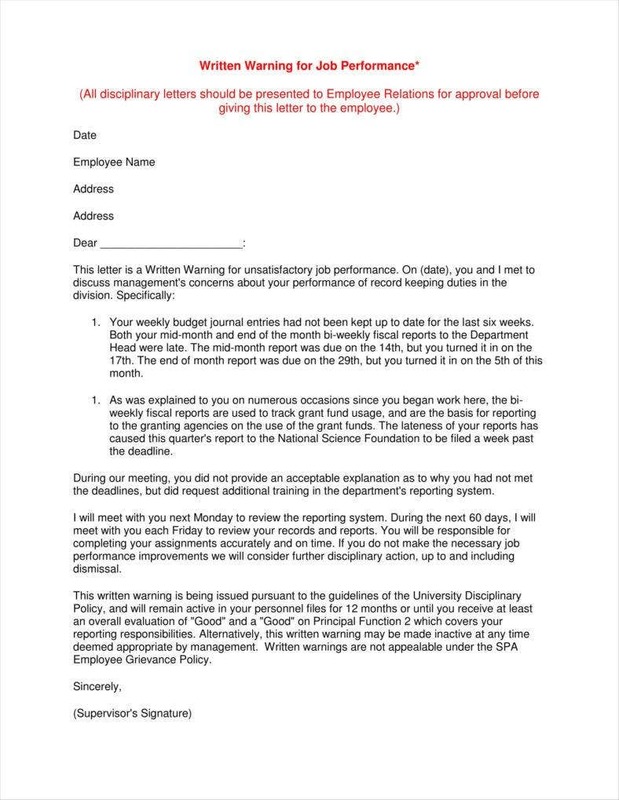 Another function of different warning letters including HR warning letter templates is that they can serve to reinforce whatever warnings or notifications were given to employees verbally. After all, this measure can help those ideas sink in to the minds of employees more strongly. This is especially relevant in the case of employees who desperately need to adjust some aspect of their behavior as the letters can contribute to making it easier for them to stick to whatever measures they need to adhere to. 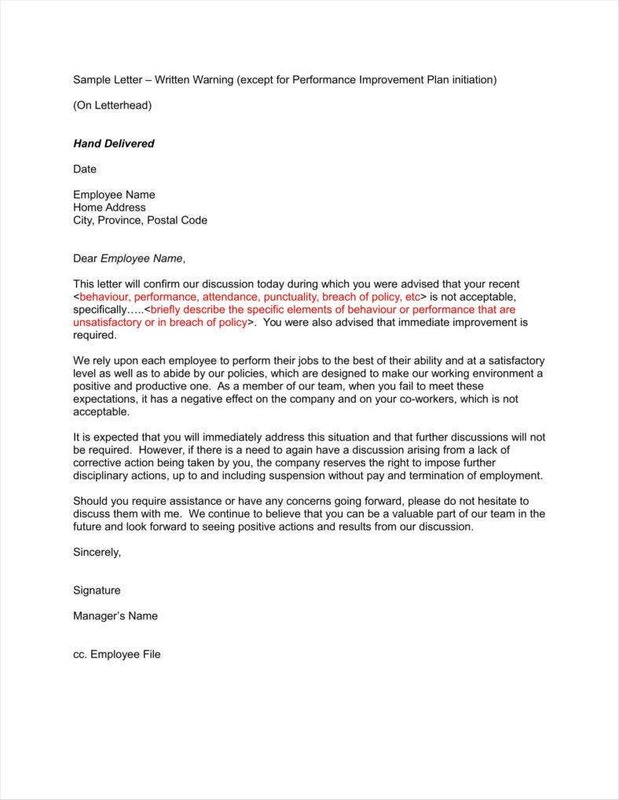 If you were really very bent on salvaging problematic employees, then verbal warning letters might be the perfect tool to help keep your employees more effective. As with other examples of professional warning letters, verbal warning letters can serve as records of both previous infractions as well as any actions undertaken to address those offenses. Being that verbal warning letters are meant as follow-ups to previous verbal warnings, this makes it much easier to establish a sense of continuity. If you were intent on establishing some kind of pattern, then verbal warning letters can serve to make it easier to understand the flow of events throughout a given situation. Furthermore, when you consider that verbal warning letters are especially useful at recording this information, this can also make it easier to refer to specific events and dates if it should ever become necessary to do so. 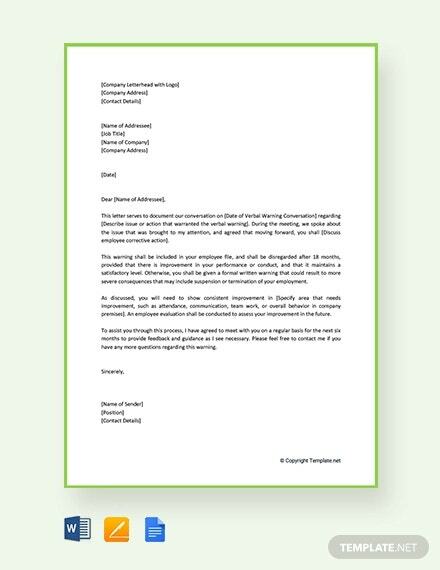 Most verbal warning letters also serve to confirm previous meetings and talks, which is visible in most examples of verbal warning letter templates. After all, this can be seen as another means of reinforcing whatever was discussed. However, the most basic need this serves is to ensure that the disciplinary process is carried out according to proper procedure. After all, the fact that the letters themselves state that they confirm earlier discussions is already written proof that the management has taken all the necessary steps to solve a given problem. 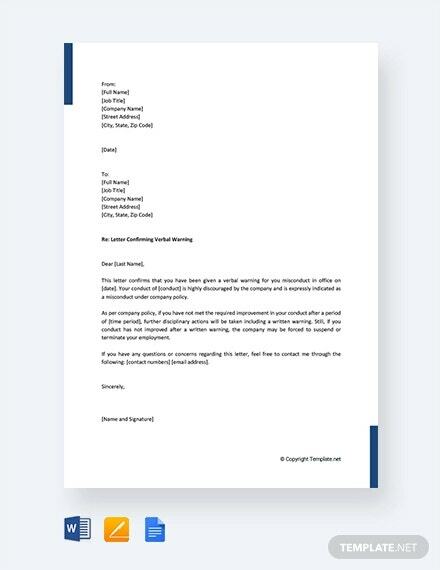 That the letter also serves as confirmation also works as insurance that both parties involved in an issue understand all aspects of the problem completely and that they are on the same page. 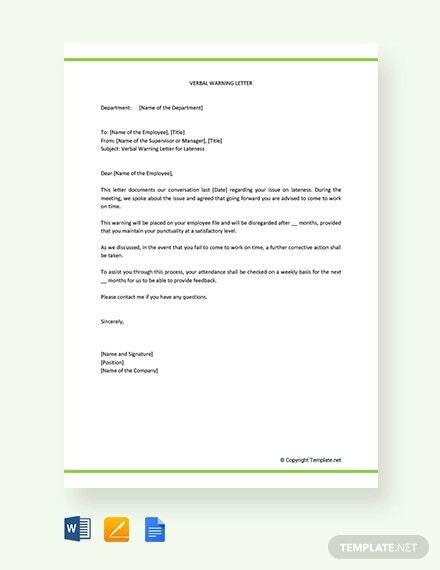 You should also be aware by now that late warning letter templates can be used in most any kind of situation, whether the issue concerns absenteeism, tardiness, or some other kind of offense. This allows these templates to be used in a variety of situations, which means you need not worry about not being able to suit your templates to specific details of your own issues. This flexibility also extends to other settings as it would be more than possible for you to apply these templates in other settings than professional ones. For example, you could just as easily use these templates as a teacher in order to be certain of being able to reach your students more easily. 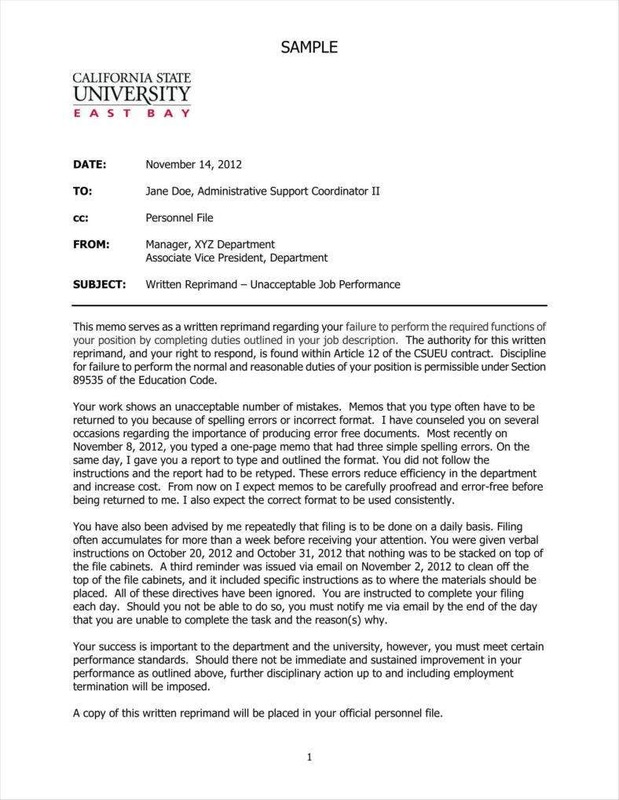 There are, of course, other essentials of an employee warning letter to consider when making one such letter yourself. For example, you might want to make use of certain tips that might help make the job of using and writing your verbal warning letters a more easy job. The same can be said of a great many other kinds of documents such as first warning letter templates. After all, there are any number of tips that you can use to make your letters all the more effective. 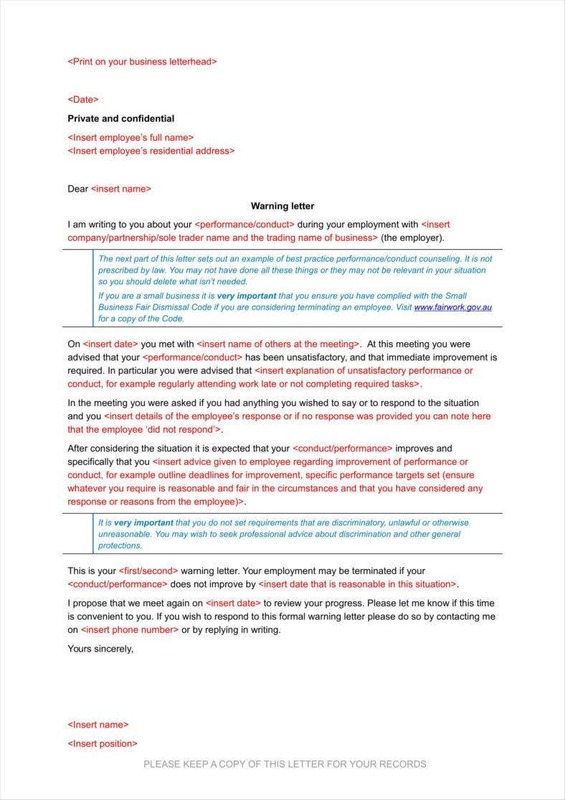 It is always important that you make the most of any employee warning letters you may wish to use, especially so in the case of verbal warning letters. 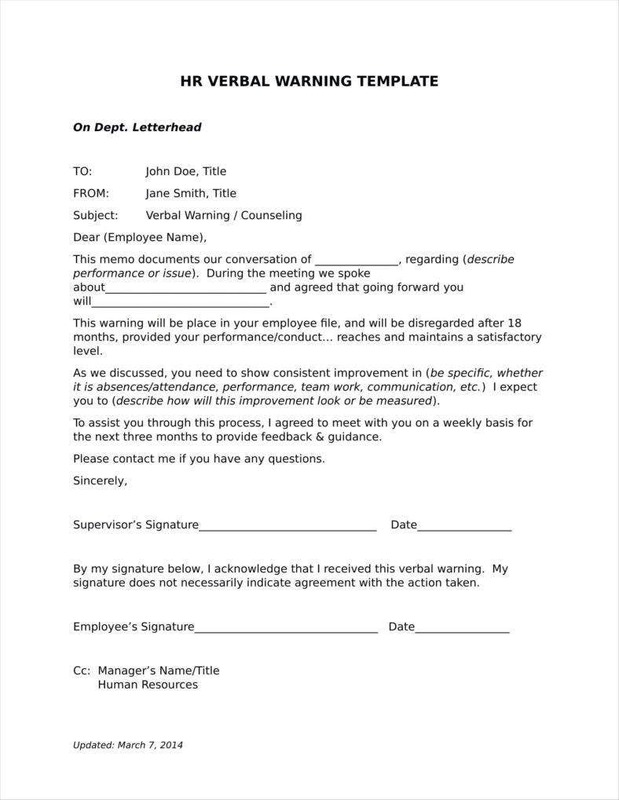 After all, these kinds of letters are in a very good position to push offending subordinates toward improving their behavior. If you were looking to complete a driving force toward helping such employees rehabilitate themselves, then you should be ready to use these letters to do so in order to get the kind of results you want. 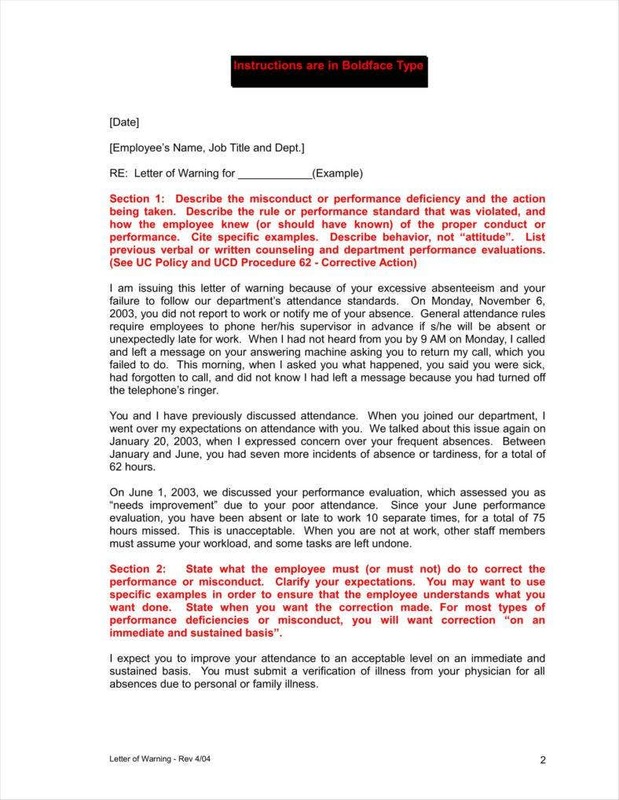 Since verbal warning letters are in such a unique position to push your employees toward improved behavior, you should be sure to include follow-up events in your letters. This can take the form of meetings scheduled for future dates as well as regular monitoring of your employees even after sending the letter. After all, if your concern is to make sure that your employees properly adjust their behavior, then you should take some time to consider what you need to do after the meetings and letter are over and done with. This can help assure you of getting your desired results with regard to your employees. Be sure to be specific regarding dates. The dates are always an important element of any warning letter. After all, you would want to properly remember all the relevant dates on which your employees committed any infractions so that you could have those recorded for the future. 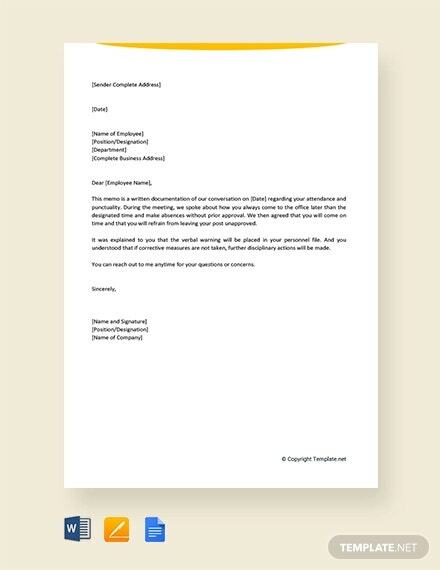 This can even be considered a basic requirement of all warning letter example templates as you would have to have the proper date listed on your letter to be sure that it can properly reflect the reality of your actions. And if you have any follow-up events listed in the future, it pays to have them included as early as possible to give your recipient a proper time frame to adjust themselves. Make sure to suit your template to your situation. Since you have a great deal of freedom with regard to choice of template and details in your sample warning letter templates, it pays if you stop to consider what templates you have available vis-à-vis what you need at the time. After all, if your letter is to be most effective, then it needs to reflect the actual situation properly. If you wanted to really address the current problem and offer workable solutions, then you need to make sure that you select a template that corresponds to the situation, if only to make the writing process easier for yourself. Include concrete goals for your recipient to aim for. If you do include any goals to aim for in your printable written warning templates, then do be sure to be specific regarding such goals. After all, the goals are meant to give your subordinates concrete milestones in the process of adjusting their behavior in general. The process can be made considerably easier if you give your subordinates a more effective map toward improving themselves. This is most definitely for the benefit of your subordinates, as this can be a measure that puts more agency in their own hands, allowing them to take a hand in their own betterment. You would want such an eventuality yourself being that such a triumph should be a more powerful one for any employee who improve himself or herself in such a manner. 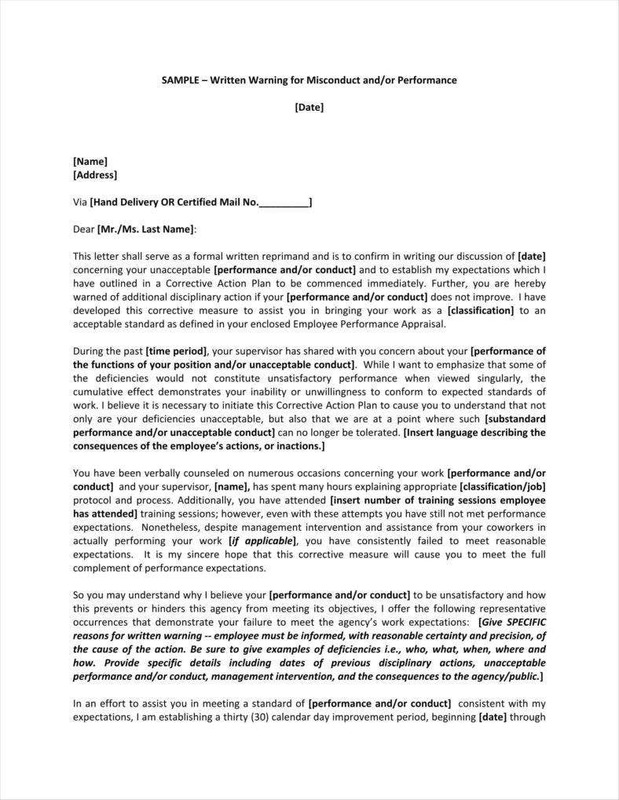 With the help of these insights, you should be able to have a better understanding of some of the basics of writing an employee warning letter, particularly if you wanted the most effective means of writing one.